India has had a long-standing love affair with gold. At Indian weddings, some of the brides get so much gold jewellery that it weighs them down. There are upwards of 15 million weddings every year in India. According to the World Gold Council, upwards of 50% of Indian demand for gold is destined for weddings. Gold is ingrained in the culture and a part of their belief system. Not only is it integral to weddings, gifts of gold are common for anniversaries, birthdays and religious festivals. Gold jewellery is not regarded solely as adornment. It is a store of wealth. At one time it was widely accepted that women could not own anything except for their gold jewellery. That custom still prevails outside the major cities. Gold has spanned centuries and millennia in India. So when the government, in an attempt to boost revenues, imposed a 1% excise duty on jewellery produced and sold within the country the jewellers, led by the All India Gems & Jewellery Trade Federation, started a 3-day work stoppage. This wasn’t the first time that had happened. Back in 2012 jewellers closed their shops for three weeks. In 2012 the government backed down. India already has an import tax and almost all the bullion consumed in the country is brought in from abroad. In 2015 India consumed 947 tonnes. Only China exceeded that total. Between them, China and India consume almost 44% of total global demand. On January 1, 2016 the Indian government introduced a requirement that everyone must quote the permanent account number (PAN) for all transactions above rupees 2 lakh. That means all sales and purchases of goods and services, including electronics, foreign holidays, and luxury items (including gold jewellery), must be reported. The purpose, of course, is an attempt to curb the black market and set up audit trails for the taxman in an effort to capture more taxes. PAN was already in effect for all financial transactions, car purchases and immovable property. India’s love affair with gold causes economic dislocations. While the government has a problem with that, the people do not. The people believe that the financial system is stacked against them. It is estimated that only about a third of Indians have bank accounts, although that is growing. Rates of return at the banks are not high, and inflation is usually higher. Opening a bank account is not easy. For many poor Indians, gold is money and can act as collateral when there is a need to borrow. Low rates allow governments and corporations to borrow cheaply, but it doesn’t help the average saver. So Indians hold gold instead of bank accounts. For them it is store of wealth, and a way to avoid taxes as well. It also helps them get around bureaucratic red tape. And then there are the weddings, the festivals, and the offerings at temples. 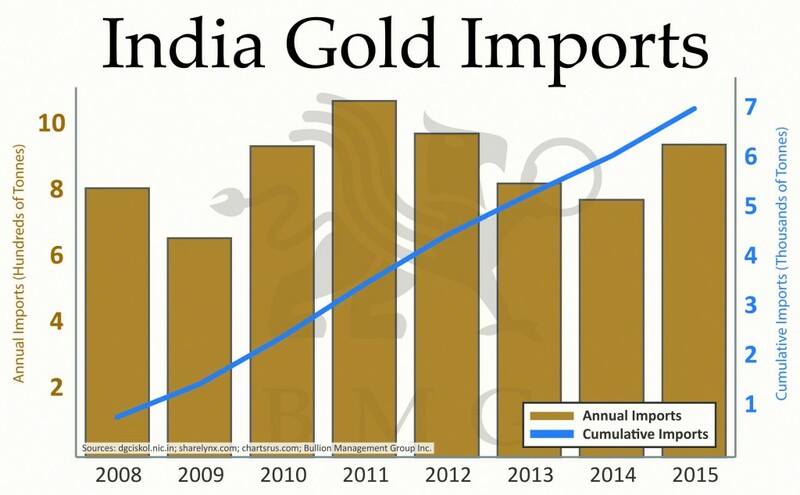 India consumes a lot of gold. As to the dislocations, since India imports almost all its gold it, contributes to a current account deficit. Despite controls on gold imports, the current account deficit has actually narrowed in recent years. Gold diverts savings out of the banking system. India may have a high savings rate on par with many Asian countries, but a big chunk of those savings is diverted into physical assets such as gold, instead of into the banking system where the banks could use the funds to lend out. The Indian government’s response to all of this is to periodically impose import quotas on gold imports, or to hike import taxes or, as noted earlier, impose an excise duty on gold jewellery. Usually, all that is accomplished is an increase in the rate of smuggling. Gold in India often trades at a premium to gold in other countries. While the 1% excise tax on jewellery appears to be largely aimed at India’s upper and middle classes, who are the largest purchasers of gold jewellery, the reality is it negatively impacts the huge manufacturing sector of gold jewellery that is primarily made up of small and micro workshops. If there is a tax advantage to the excise duties, it is with the government’s Sovereign Gold Bond Investment that is issued by the Reserve Bank of India (RBI) along with other gold monetization schemes that have been launched. With these investments, the government is trying to persuade Indians to give up their gold in return for a gold bond that would pay them interest. When one returns the gold bond for redemption, instead of getting gold you get cash. The result is you don’t need to buy gold and store it; you can instead hold a “piece of paper” tied to gold. Apparently it hasn’t gone over very well, despite the bond having a minimum investment of 2 grams (0.065 of a troy ounce), and is capped at 500 grams (16.1 troy ounces). In Canada you can purchase a gold certificate from a bank for a minimum of 5-10 ounces, depending on the bank. The Indian sovereign bond can be bought by both individual Indians and by deities, which in India have rights under law. Apparently Indians would rather hold on to their gold, rather than give it up to the government in exchange for a piece of paper. So why is the Indian government trying to entice gold from the people? India has a planned membership in the Shanghai Cooperation Organization (SCO). This organization, founded by China and Russia plus others, is an Asian-based organization that will contain over half the world’s population. Its purpose covers a wide range from military cooperation (some see it as a counterbalance to NATO) to economic cooperation among Asian nations. China and Russia are the clear leaders. One of the SCO’s goals is to see the recreation of the Silk Road, trade routes that linked the Asian continent by land and sea to Europe. India sees the SCO as important to its economic well being and to future economic prospects. The organization will be incorporating gold into its monetary system. China and Russia, the two founding members, have already begun building up their gold reserves. China and Russia are also two of the world’s largest producers of gold, and they consume much of their own production. 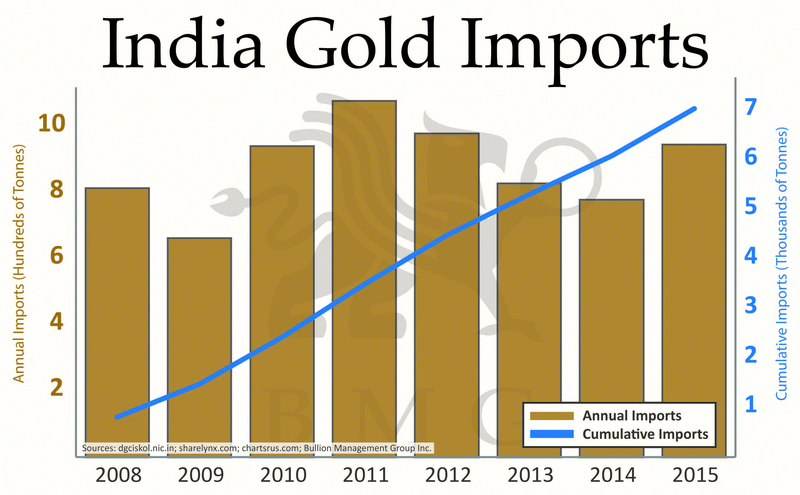 India does not have that luxury, and imports virtually all of its gold. Despite India’s long-standing love affair with gold, it only recently began making large annual purchases. Back in 1982, India only consumed 65 tonnes of gold. Imports were banned until about 1990 and, as a result, most of the gold consumed came via smuggling. The premium then was about 50% to the price of gold, well above today’s minimum 10% premium. At that time, poor farmers bought gold as currency and collateral to get them through hard times. Farmers also used gold as collateral to reacquire their land from local landlords. The chart below shows the huge imports that India now regularly consumes. The problem for India is that the government sector is competing with the people for gold. India’s central bank, the RBI, holds only 558 tonnes of gold, representing 5.4% of official reserves. China holds, officially at least, 1,762 tonnes, although that is only 1.8% of reserves. China is looking to grow its holdings considerably. Russia holds 1,392 tonnes of gold, or 13% of its reserves. Compare that to the United States, which holds 8,133 tonnes, or 72% of its reserves; Germany with 3,381 tonnes, or 66% of its reserves; Italy with 2,451 tonnes, or 64% of its reserves; and France with 2,435 tonnes, or 60% of its reserves. At the other extreme is Canada, with 77 ounces of gold, or effectively 0% of its reserves. Nonetheless both China and Russia are accumulating gold, and they have announced intentions to back their currencies, the yuan and the ruble, with gold. Gold is to be central to the future of the SCO. All of this is to promote sound money policies. So India needs a way to obtain gold, and one way to do that is to encourage its people to part with their privately held gold, hence the gold bonds and other monetization schemes. India’s people are estimated to hold some 22,000 tonnes of gold, according to the World Gold Council (WGC). Compare that to the 558 tonnes held by the RBI. According to a survey by the WGC, some 77% of Indian consumers bought gold as an investment in 2013, although much of it is in the form of gold jewellery. Less than half might consider depositing their gold to earn interest. The figure is unlikely to be much different today. No wonder the Indian government is trying to encourage Indians into gold deposit schemes. There is even fear that if the government cannot obtain sufficient gold through enticement schemes, it might resort to expropriation. Given the huge rallies against the 1% excise tax, expropriation is likely to spark even larger demonstrations, and possibly even riots. India’s demographics are also driving the demand for gold. India has one of the world’s fastest-growing populations. Its current population is 1.28 billion vs. China’s 1.4 billion. But India’s population is growing faster than China’s. While India’s population growth rate is not that high when compared to a few, mostly African, countries, the fact that it is on such a high base results in large numbers. India is projected to be the world’s most populous country by 2022. Some 50% of the population is under 25, and 65% of the population is under 35. With many moving into middle-class status, this and the high youth demographic could help keep the demand for gold high. There is a story that may highlight India’s love for gold. The Sri Padmanabhaswamy temple has been around for centuries, with references dating back to 500 BC. The temple is noted as the richest Hindu temple in the world. It is also noted as the wealthiest institution and place of worship of any kind in recorded history. Apparently only those of the Hindu faith are allowed entrance to the temple under a strict dress code. The treasures of the temple may be worth billions, and some have suggested in excess of one trillion U.S. dollars. Worshippers come to make offerings of flowers, incense, silver and gold. Whatever wealth accumulates belongs to the deity. It is not surprising to learn that the temple has been the subject of lawsuits as others, including the government, would love to get their hands on the wealth. But they have been unsuccessful. Whatever is there or being offered today is the property of the deity, and in India deities have rights under law, although as minors. But courts have a duty to protect it. There is a desire to create regulations that would protect the temple from plundering by the state and others. The temple embodies India’s belief system and its culture. The result is that the temple and its riches remain protected. 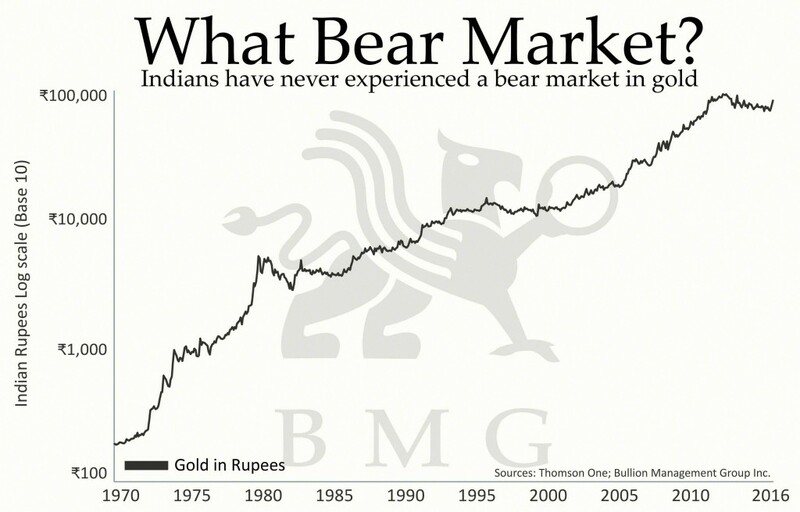 The people of India have never experienced a bear market of any consequence in gold. 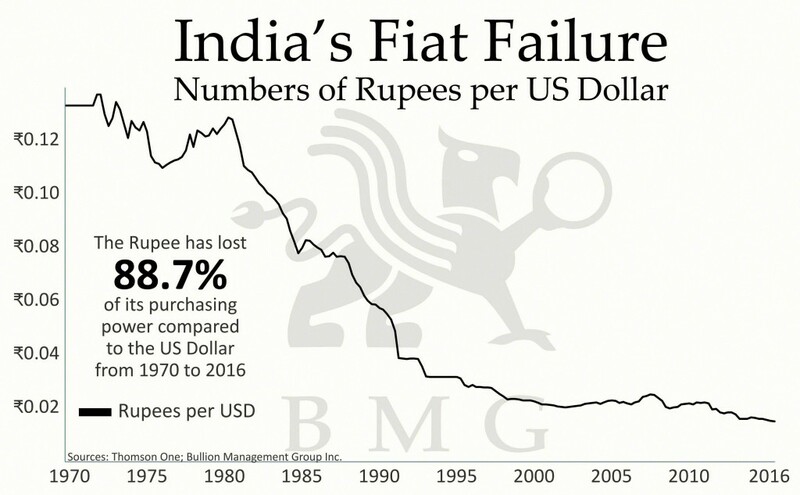 Since 1970 the Indian rupee has lost 88.7% of its purchasing power compared to the U.S. dollar. But the people’s purchasing power has been maintained thanks to gold. 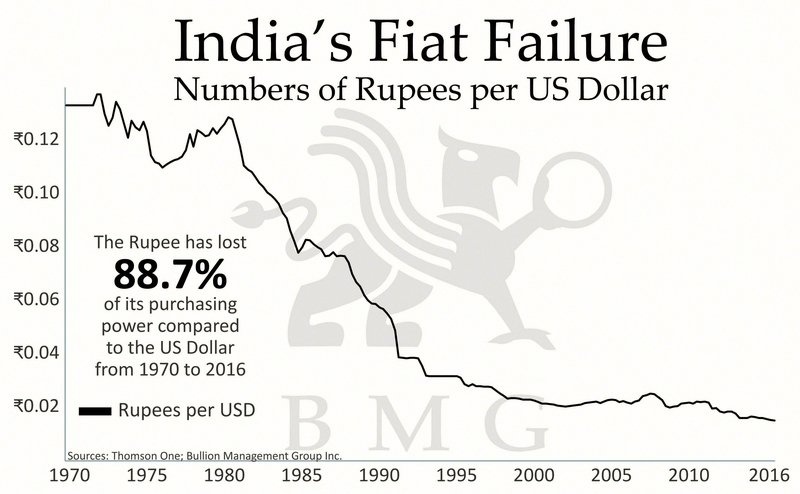 The first chart shows India’s fiat failure, with the rupee falling sharply in purchasing power. The second chart demonstrates how India’s purchasing power has been maintained thanks to the rising price of gold. 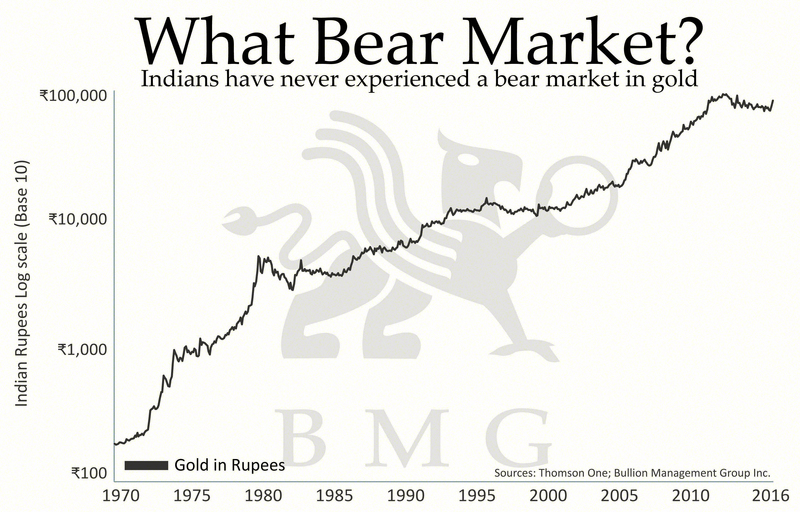 The people of India have never experienced a bear market in gold. Gold may be intricately intertwined with their beliefs and their culture, but it has also allowed to the people to maintain and preserve their wealth. Maybe that explains why the people are reluctant to give up their gold for a piece of paper from the government. Westerners may have something to learn from India’s love affair with gold.